Hurricane Tomas has lashed islands in the eastern Caribbean, bringing down electricity poles and ripping roofs off houses. Heavy rain and sustained winds of 75mph (120km/h) have struck St Lucia and St Vincent in the Windward Isles. 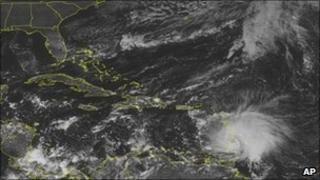 Barbados had also earlier suffered damage from the Category 1 storm, though no deaths have been reported. There are fears the westward track of Tomas could take it near earthquake-ravaged Haiti later in the week. The US National Hurricane Centre said that at 1800 GMT, Tomas was located about 10 miles north-east of St Lucia, heading westwards out to sea. By the middle of the week it could strengthen to a Category 3 or 4 hurricane, south of the Dominican Republic and Haiti. Barbados, Tobago, Grenada and Dominica have had storm warnings, while a hurricane warning was posted for St Vincent and the Grenadines, St Lucia and Martinique. Winds ripped off roofs of a hospital and a school in the eastern village of Dennery in St Lucia. The island's largest Creole festival was cancelled. The biggest fear is that Tomas could affect Haiti, where around 1.5 million survivors of January's earthquake are living in tented camps vulnerable to high winds and heavy rain. Haiti has already been stricken recently by a cholera outbreak that has left more than 300 people dead. Imogen Wall, UN humanitarian spokeswoman in Haiti, told Reuters news agency: "A hurricane is one of the things we've been preparing for... but we're stretched to capacity handling the cholera epidemic. "It's obviously the last thing Haiti needs."